Whoa, WFMU’s Debbie D and company have gone bonkers over at the Rock ‘n’ Soul Ichiban site. There are photos of Phil Spector, circa 1958, looking remarkably sedate. 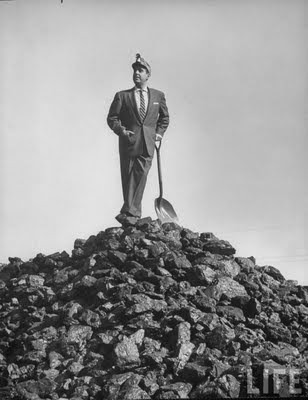 A picture of Tennessee Ernie Ford standing atop a pile of coal, advertising “Sixteen Tons.” A portrait of burlesque star Coco Barr brandishing a pair of pistols. And, of course, there’s music galore: The Collins Kids, performing on the U.S. Air Force’s Country Music Time show. Big Star. Dexter Romweber. “The Patio Twist.” And an incredible live stream of “obscure ’50s and ’60s rock ‘n’ soul.” I’m listening to Huey Smith and the Clowns right now! In other WFMU news, the Trashmen will be performing at the Record Fair, slated for Manhattan’s Metropolitan Pavilion on October 23rd, 24th and 25th! Best thing since The Hound archives! WFMU Ichiban is a walk down R&B memory lane.